Hands down, this is one of my favorite books of this year. 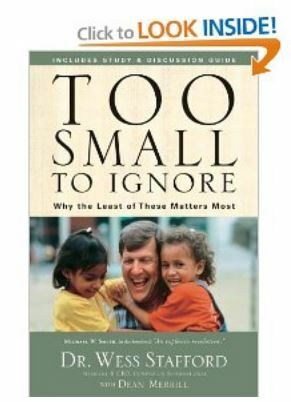 When I ordered Too Small to Ignore: Why the Least of These Matters Most, I didn’t realize that the author, Dr. Wess Stafford, is the CEO of Compassion International, the group that I am traveling to Nicaragua with next week. (Learn more about my trip to Nicaragua.) When I realized that, I knew it was a God thing that I had ordered the book. Too Small to Ignore served as a great introduction to the ministry of Compassion International for me. It chronicles Dr. Stafford’s life, revealing how his early childhood shaped who he is today and exploring his drive and determination to minister to children. The Bible makes it blatantly clear that our best investment is in ministering, serving, and loving children. At first I thought the book would be about sponsoring children, which is what Compassion is all about, but it goes much deeper. It discusses the important role that children play in our society, and the shame of how they are so often overlooked and just swept to the side, not only in Western culture, but everywhere. They are the last to be cared for. Dr. Stafford includes in the book an entire section of Scripture where Jesus talked about children, teaching people that children are the heart of the Lord. Jesus showed through His teaching and his life that children are the future, and we are to love them and raise them up in the Lord. Take, for example, the story of the boy who shared his lunch. That little boy gave everything he had to Jesus, and he gave it with great faith. He was not jaded by the world like adults often are. The role of children is great in our society–they often reveal Christ’s character, His joy, and His truth to us. We don’t need to undermine that. They can do so much more than we give them credit for, especially spiritually. They often redirect us. In fact, I can honestly say that most of the time when I’m redirected to focus once again on the Lord it’s because of something my kids have said or done. Dr. Stafford shares his own personal story, that of growing up the child of missionaries to Africa, and seeing poverty and suffering firsthand. He has also experienced the trauma of child abuse, enduring both verbal and physical abuse from the staff at the boarding school he attended. Just as you begin wondering why such a horrible atrocity happened to people who loved and served the Lord, you have to look at the man’s life and see all the good that has come from it. This was an amazing book, and I encourage you to read it too. :: Order Too Small to Ignore: Why the Least of These Matters Most from Amazon HERE. Find more Book Reviews on Faithful Provisions. I’m adding this one to my reading list.